A gorgeous sterling silver handmade and hallmarked bumble bee charm. This lovely silver handmade bumble bee charm can be bought with a silver snake chain (see necklaces) or on it's own and has a ring attached so it can be strung onto other chains. Delightful textured drum rings in 9ct yellow gold, white gold and rose gold set with a faceted 6 x 4mm ruby, emerald, sapphire or diamond. The width of the ring is approximately 8mm. Prices from £900, for further information on any of these rings please contact us. Pretty little round amethysts set in sterling silver and 18ct gold vermeil hanging from gold vermeil mini hoops. The amethysts are 6mm round and the earrings hang approximately 2.3cm from the earlobe. They have earring stoppers at the back. 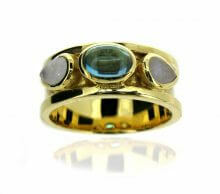 Beautiful, eye-catching blue topaz and moonstone drum ring. The ring is 8mm wide and 2mm thick at the top and the bottom. The cabochon blue topaz is 7x5mm and the pear shaped cabochon moonstones are 6x4mm. Please select your ring size. Unique hand made sterling silver and gold vermeil earrings with a distressed effect. These easy to wear earrings have a beaten textured ball stud finding for extra security and makes them attractive and practical for every occasion. Each earring measures approximately 1.5cm across and 3cm from the top of the earring to the bottom. Also available in silver. A gorgeous sterling silver and 18ct gold vermeil handmade and hallmarked bumble bee charm. This lovely bumble bee charm has a ring attached so it can be strung onto other chains. Also available in sterling silver. Lovely sterling silver and 18ct gold vermeil necklace with pearl drop. The standard length is 45cm but can be a different length if required. Individually handmade ancient style sterling silver and gold vermeil coin stud earrings with a pearl drop. These easy to wear earrings have a ball stud finding for extra security and makes them attractive and practical for every occasion. They measure approximately 3cm from the earlobe. A gorgeous sterling silver and 18ct gold vermeil handmade and hallmarked honey bee charm. The charm has a ring attached so it can be strung onto other chains. Charming hand made solid sterling silver and gold vermeil honey bee cufflinks with t-bar fastening. The bee is approximately 2cm x 3cm and the cufflink is approximately 2.5cm in length from bee to fastening. Also available in silver.